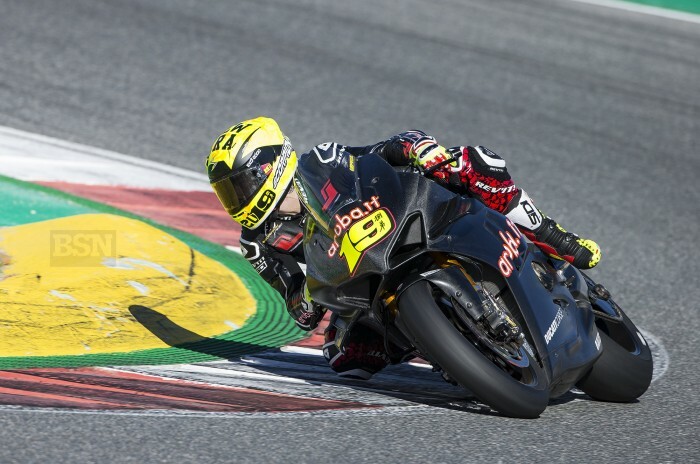 Championship new-boy Alvaro Bautista has adapted well to WorldSBK although the rider himself says that he has a lot to learn in his new role as factory Ducati V4R rider. But in finishing day two at Portimao in third place overall, he obviously moved on as he set more consistent fast laps. The main challenge of day one at Portimao is the roller-coaster circuit, and all those blind and dramatic changes of direction. It was all-new and it challenged him in the early stages. “For me this was a new track and in the first morning I struggled a lot because it was quite difficult with all the up-and-downs, and I was lost during all the laps,” the Spanish rider told bikesportnews.com. On the first day at Portimao Bautista, a class rookie to WorldSBK entirely, was understandably unsure as to how ready he would be for the WorldSBK championship if the race started the next day, rather than more testing. “I dunno because test are tests, and races are races. For sure I feel better than Jerez. But not 100 per cent. I think myself with the bike we are 85 per cent. And the bike needs also to improve. I think we have some room for improvement. Although Bautista is yet to take part in a WorldSBK race weekend yet, and there for it is a slightly unfair question to ask, he was asked for his experiences of the is the contrast between WorldSBK and MotoGP. “At the end I work with my team, my mechanic, my engineers, and inside the box the working is basically the same,” said Bautista. “The only difference is the bike, tyres, electronics, brakes, but at the end you work with your team is basically the same. Bautista, like most of the rest of his new peer group, has two more days of testing in Australia to do before the racing starts for real at PI on the last Saturday and Sunday of February.